As you can tell from the above time tables, I have had to do quite a bit of sneaking out of work early to meet with wedding vendors. So I have come up with my quick change wedding planning outfit. An easy update from a tee + jeans is a classic button down, statement necklace that hides lunch stains + a pretty tote that can carry my laptop, wedding planning binder & camera (not in my bag when pictured because it was in use, but there is still plenty of room!). But seriously, how do you plan a wedding without showing vendors the unachievable pictures you have found on Pinterest!? I love the Chandra bracelet! I really like the Levi necklace. I can't explain why. I love the necklace & tote! Oh, and for the giveaway I like the Braylee necklace! 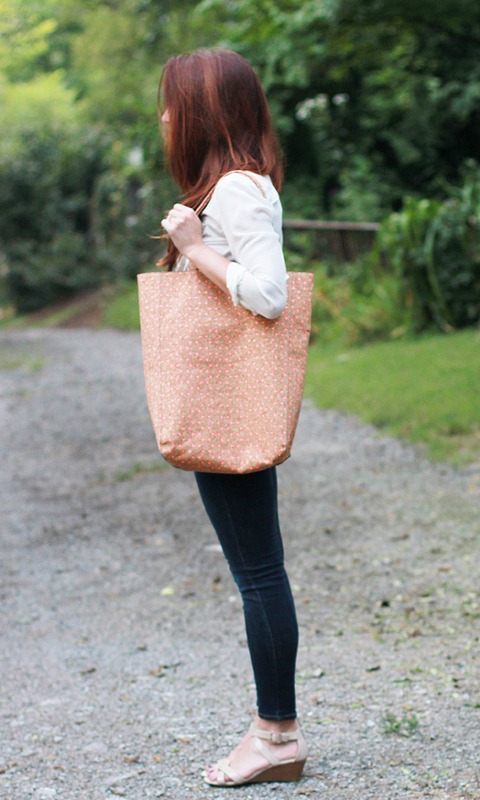 gorgeous bag and love the tavita! That is truly the perfect white blouse! You look so chic and comfy too! I love the Divya necklace! I love the Bellari Necklace! This is the PERFECT wedding planning outfit! Love the simple pieces and can't wait to see what you dream up for your nuptials. I remember having those scheduling problems when trying to plan my wedding. Luckily, I had to do some evening training at work, so I was able to take the afternoons off for vendor visits! I love the Paleah necklace! So true....this is an easy outfit to wear/put together, but makes you look "put together" at the same time. I hope all the wedding planning goes ok...I know it's so stressful...especially when your schedules don't match up!! 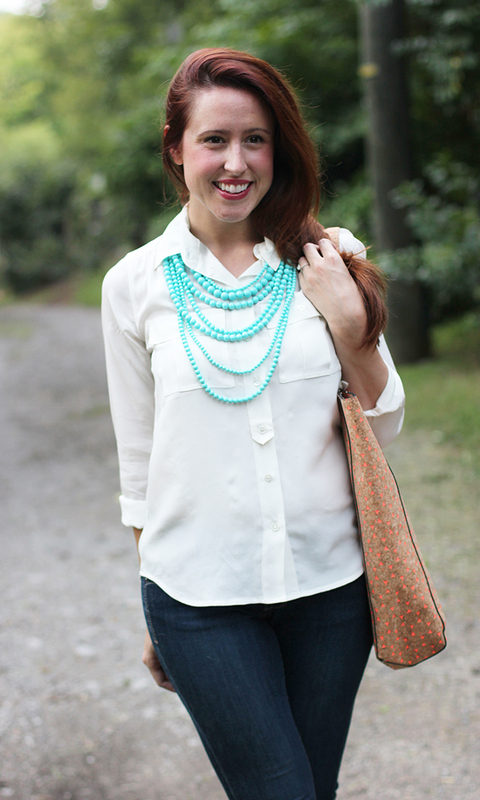 I love the ainslie necklace! This is the perfect wedding planning outfit. 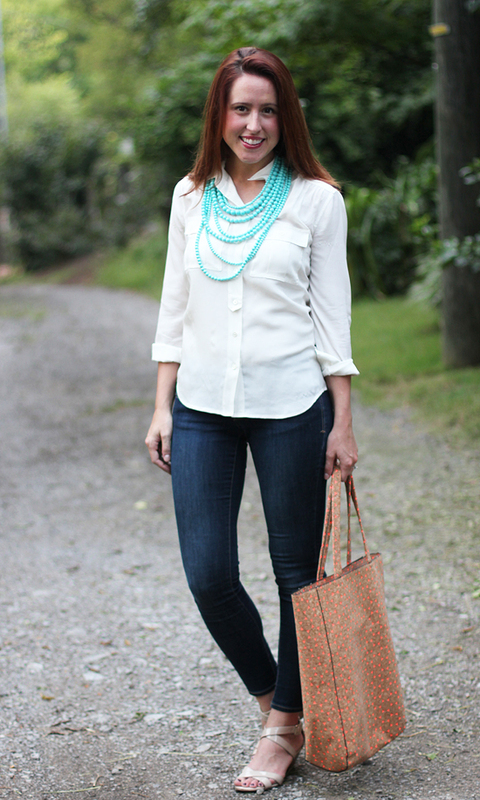 White, a statement necklace, comfy but cute jeans. Perfect! And YAY for a giveaway! I think the Ainslie Necklace is so pretty! I love that Asher necklace!! Loving turquoise!! 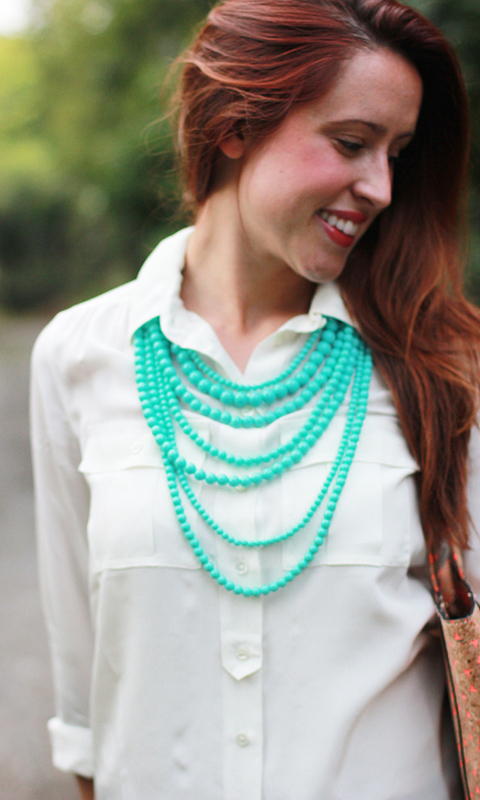 The Divya necklace is gorgeous! I like the Anika bracelet. I love the intense shine of it! I love the Tavita Necklace! White button down saves the day! I find i good one can be used to make any type of bottom look more put together. I absolutely LOVE the Mia bracelet! would have to say my fav is either the avery or divya necklaces! Im loving the ballari necklace! Theres some great pieces in this shop! Thanks for introducing me! I like the Amelia necklace. I like the Abbie Bracelet! Thank you. the abble bracelet is my fave!